The 29th Oregon Brewers Festival blasted off yesterday with the brunch, parade and ceremonial tapping of the first barrel, this one provided by host brewery, Laurelwood. There was a large, but mostly quiet crowd on hand to kick things off. Wednesday might just as well be called "industry day" at OBF. Because there are countless industry-connected deadbeats hanging out drinking beer, networking and seeing the sights. That includes the so-called beer media, which is always well-represented. Trust me. This is my 25th OBF, 24th in a row. I missed 1988 (not yet here), 1989-1990 (here but not yet paying attention) and 1992 (mysteriously out of town). A lot of things have changed over the years, The event has grown and evolved. 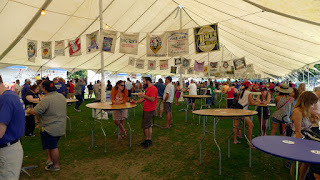 One of the things casual bystanders probably aren't aware of is the extent to which OBF is much more than just a beer festival. Countless private parties and sideshows litter OBF week. In effect, the festival is the central event in a sea of unconnected spin offs. Craft beer is big business and Portland is a central player in that business. Which means the money flows. But never mind the details. 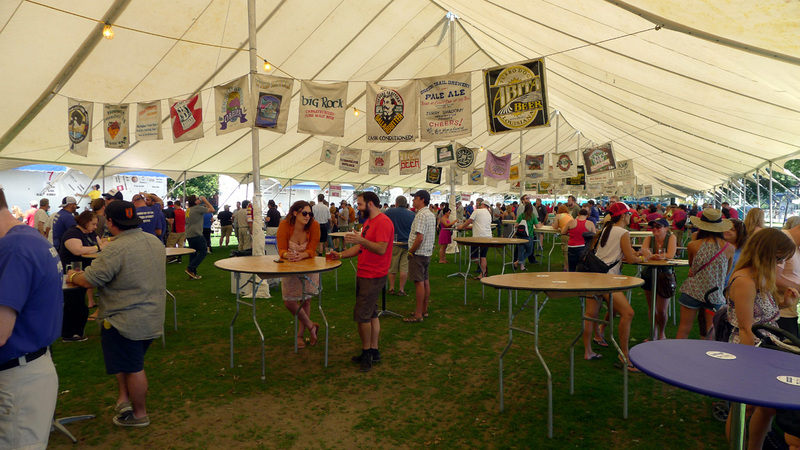 You aren't interested in the politics of the Oregon Brewers Festival or the economics of the beer industry. You don't know how lucky you are. Below are some of the things you may want to know about the festival. 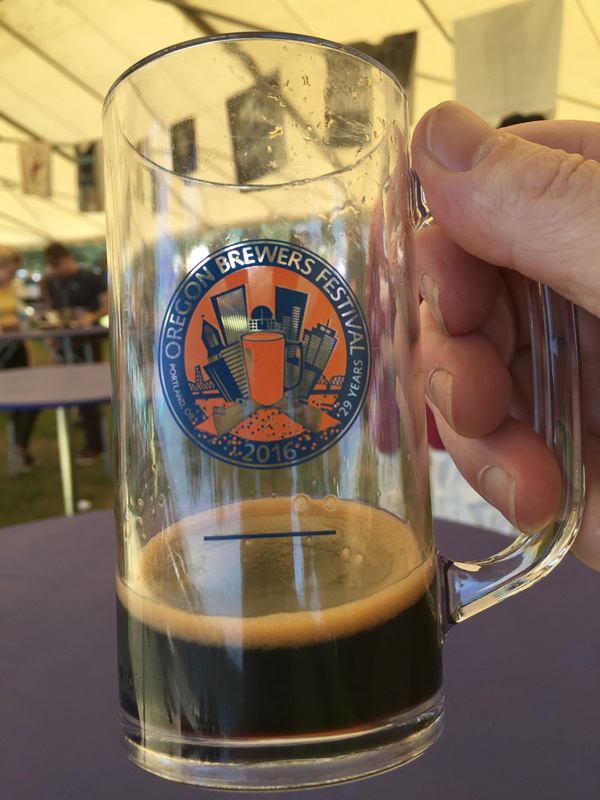 Unlike most modern festivals, the OBF does not require you to purchase a tasting package. So you won't have to shell out $25 for a shoddy package that includes a mug and 10 tokens. Instead, you can buy a mug for $7 and tokens for $1. Yes, you can buy a package. But you don't have to. I talked to several people who didn't know that. It's always a good idea to stay as hydrated as possible while tasting/drinking beer. Watering stations are scattered around the park and you can buy outrageously priced bottled water from the various food vendors. A better idea is to bring your own. They have not always allowed it, but you can, in fact, bring in water. Do it. Unbeknown to me, the bike parking area moved. In recent years, it was located at the Northeast corner of the park. I expected to find it there yesterday. No luck. And no signage telling me where to find it. The gate staff could give me only a rough idea of where to find parking. Well, it's at the Southeast corner of the festival space, on the other side of the Morrison Bridge. FYI. I think they've upped their game this year. Between the 88 or so beers pouring in the main tents and the 25 or so pouring in the International Tent, organizers have done a nice job in terms of variety and quality. Also value. I didn't see a single multiple token beer. That doesn't mean none exist; it simply means the majority are one token beers. Nice. It's a bit of a slippery slope recommending beers to folks who certainly have different likes and dislikes. Plus, I tasted only 30 or so beers, out of more than 100. It's fairly condescending for anyone who hasn't tasted all or most of the beers to recommend anything. Still, I can tell you what I did like. A good place to start your tasting is with 54°40' Brewing's Ultra Pilsner, an easy-drinking, refreshing interpretation of the age-old German style. This beer's light enough (5.1% ABV) that you could easily drink a full mug. Best move on and return later. For hopheads, I recommend High Desert Diesel by Sunriver Brewing. This is an Imperial IPA that clocks in at 8% ABV, so be careful. It leans on nine hop additions for aroma and flavor. I'd guess this is a bigger version of the popular Vicious Mosquito, a favorite of mine. Another IIPA, this one from Melvin Brewing, 2X4 DIPA (a whopping 10% ABV), is also a winner. Some will say a summer beer festival is no place for stouts and similar dark beers. Not so. There are two stellar stouts pouring on the south side, Dragon's Milk Reserve (10% ABV) by New Holland Brewing and Serpent's Stout (11% ABV) by Lost Abbey Brewing. Both are excellent. I also ran into a nice Baltic Porter from Japan's Baird Beer in the International Tent. With respect to sours, I tasted or shared tastes of maybe 10. Most lacked fruit character and were simply sour. If that's what you're looking for, great. I enjoyed Breakside's Pomegranate Gose (4.6% ABV), which is moderately tart and refreshing. I also liked Green Flash's Passion Fruit Kicker (5.5% ABV), an unfiltered wheat beer highlighted by notes of passion fruit and subtle white tea. I don't like to dwell on beers that sucked or weren't quite right, but there are always a few. One of the more notable ones was Sagefight from Deschutes. It's supposed to combine citrusy hops with sage and juniper berries for flavor. But it somehow collapses into a murky, bitter mess. Surprisingly bad. I had to dump it. Best avoid. With all that said, there are plenty of great beers to try. As always, the best times to attend will be Thursday, early Friday afternoon and Sunday. Things tend to be a bit crazy under the tents Friday evening and most of Saturday. There's a lot more info on the event site here. You knew that.